To customize this template after signing up, choose ‘Feedback’ as example when creating a new survey. Avoid yes or no types of questions, this can lead to making the wrong decisions when taking conclusions from your feedback results. After receiving your results, use the correct benchmarks to determine how to implement change e.g. If you notice 10% of your attendees said they did not eat the lamb roast, maybe it was because 10% was vegetarian and not 10% did not like the roast. 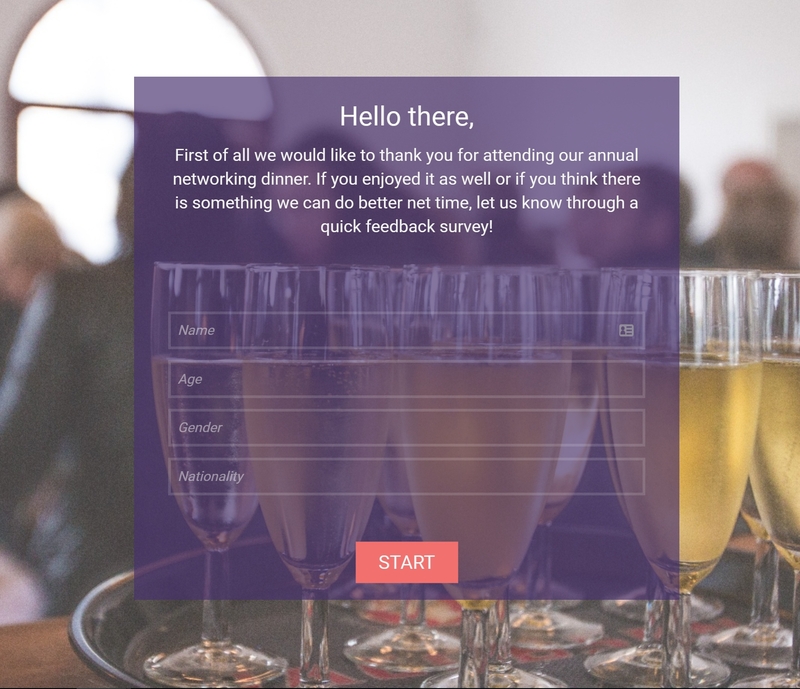 Send out your feedback survey immediately after the event. This way the event will still be fresh in the attendees’ minds, enabling them to give an actionable, detailed report on their experience. Know your attendee. Ask some demographic questions such as age, gender, nationality etc. This way you’ll know which group of people to market to in the future and which people are less likely to attend your event next time. Why use Survey Anyplace as Feedback Tool? Fast data capture on tablets and smartphones, this enables people to easily and quickly give the feedback you need. You are the master of your domain. Add a captivating background image and experiment with all sorts of different fonts and lay outs. Make your survey one to remember! To use this feedback survey, sign up for Survey Anyplace , and choose ‘Feedback’ as template when creating a new survey. It is important that the feedback details can be collected efficiently and are analyzed objectively and profesionally to take senseful conslusions. Using mobile-opimized, smartphone and tablet friendly feedback surveys is the best way to go about this. Use Zapier to automatically move results between your web apps.